There are very few guarantees in life other than the fact that everyone will need final and parting services at some point. While no one likes to think about their own death, it’s important to recognise the different types of services so family members can prepare for the costs and make the proper arrangements that are in your best interests. There are two important choices you need to make. When someone passes on, they are either given a funeral with a traditional burial or a cremation. The best part about the options is that both are completely respectful and dignified. No matter what you choose for a family member or for yourself in the future, you know that either option is valid. There are no concrete right or wrong answers – the decision is yours. If you are making choice on behalf of another person, you have to decide what’s right for your family and the specific situation at hand. As is true with any major decision, there are pros and cons for funerals and cremations. Consider them with care as you move forward with planning final services in advance for yourself or for a loved one who has recently passed away. While you want to give your loved one a final service to honor their memory above all else, the cost is always going to be a consideration. Some people leave funds for their funeral or take out funeral insurance and specify exactly what they want (i.e. their “wishes”). In those cases, the decisions are easy and the costs are covered. Yet, that is not always how things turn out because the cost is an important consideration. The average funeral cost in Australia ranges from $4,000 all the way up to $15,000 and not every family has that much money to spare. In relation to expenses, traditional funerals have many negatives. They are more expensive than a cremation for a number of reasons. First, funerals have a lot more products and services involved that you have to purchase. You might need to embalm your loved one, for example, and you will need to buy a casket. You will have to purchase a burial plot in the cemetery and a headstone to mark your loved one’s grave. The list goes on and on and none of those products or services are inexpensive. Second, having a visitation and a funeral service for your loved one also costs extra money. You will most likely purchase flowers, pay someone to preside over the service, be in need of a hearse for transportation, and so on. When you look at individual costs, the overall cost for a funeral adds up to a large amount when everything is complete. On the other hand, cremations cost much less. You do not need the extra products that you absolutely need for a funeral and that lowers the cost a great deal. 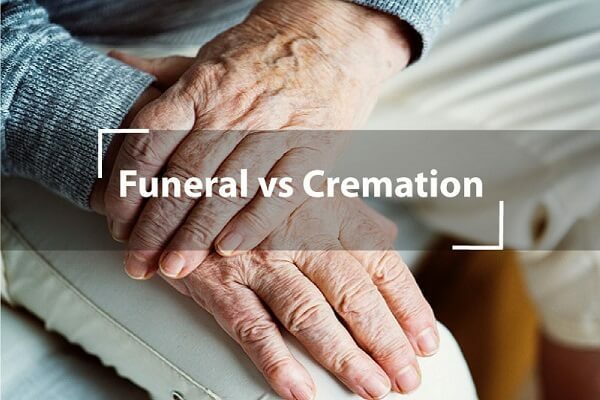 Cremations are not very expensive and it can be the one and only service you need for your loved one’s final departure. You can have a cremation done for less than $2000, a price which includes everything you need all in one place. You can, of course, purchase your own urn, which might cost more, or have a memorial service of your choosing, but the cremation cost itself is low in price compared to other options. Traditional burial and cremations are only one aspect of the entire service you can have after someone has passed on. With a traditional burial, you will generally have a full funeral as well, complete with a visitation, a funeral service, and a burial ritual. These services have a lot of traditions that go along with them and they can be very comforting. The various options are important considerations for families who feel they need those rituals to say goodbye and get closure over their loved one’s passing. However, if you want any kind of leeway on timeframe or service type, regular funerals have its negatives. There are many pros that go along with cremation services because they are so versatile and flexible, you can do anything you like. With a funeral, the service generally has to take place within a few days of the person’s death. With cremation, the memorial service can take place at any time. You can still have the service a few days after the person’s passing, or you can have the service a week or month later or whenever you like. If not all of your family lives in the same region of Australia, travel can take time and planning needs to be undertaken. Cremation allows you to adjust the schedule around your family’s needs to ensure everyone who wants to be at a memorial service is available. A Cremation package allows you to have whatever type of service you choose. Some families like to have a memorial service that feels more like a funeral with readings, hymns, and a eulogy. Other families want to have more of a celebration of their loved one’s life where they include colourful clothing, happy memories, laughter, upbeat music, videos, among other things. If your loved one didn’t want a big fuss made over them, you could even do something simple, like a gathering in a park for an ash scattering ceremony followed by a meal at a family member’s home. The options are virtually limitless and you can do whatever your family needs and what would honor your loved one in the best possible manner. That freedom allows cremation packages to be a huge advantage for most people. If your loved one passed on in their hometown and wishes to be buried there, you only have to transport them to the cemetery. However, that’s not always the case. If your loved one moved, but wants to go back to their hometown after death, or if you want to take them to another location for a service so loved ones can more easily attend, things get complicated. Traveling ease is a huge con for traditional burials. You have to have a hearse to transport your loved one from one location to another. That is an expense with a traditional funeral, but it would be a greater expense if you want to take your loved one out of their immediate area. On the other hand, traveling ease is a positive for the cremation option. Cremated remains are encapsulated in an urn that can be taken anywhere. You can place the cremation urn in a safe spot in your vehicle and travel wherever you’d like to have a service. You don’t need extra help or a hearse driver and vehicle to take your loved one’s remains anywhere you want to go when you choose a cremation. That allows you to choose any location you’d like for a service and the freedom to move your loved one on your own. The negative choosing a cremation is that the outcome is permanent. There is no changing your mind later after the process has occurred. Family members need to be absolutely certain they want cremation for their loved one before they move forward with the process. This can be an emotional consideration that requires careful consideration. Traditional funerals, however, can be changed later. If you move forward with a visitation and funeral for a loved one, you can still have them cremated later after you have decided what you want to do. This is the only negative for a cremation if you are uncertain if it is the right move for your family. Speak to family members, people who have had cremation services for their loved ones, and cremation professionals to ensure it is the right choice for you and your family. When you have a traditional burial service for your loved one, you will have to purchase a burial plot where they will be placed. The cemetery you choose is a concrete location that will never change. Some people see this is a pro because they like the idea that they have one location in which to visit their loved one to remember them in the future. However, there are many cons that can come up as well. If you move to the other side of Australia, for example, it will be a lot harder to visit the grave. You might feel like you are leaving your loved one behind and losing them all over again. With cremation, you have options for final resting places as well. You can bury the urn or the cremated remains, just as you would in a traditional burial, if you so choose. Plots for urns are a lot smaller and, therefore, less expensive. But there are a lot of other options to consider as well. Some families like to keep the urn and the ashes on a mantel in their home or within a cherished piece of furniture. Others scatter the ashes in a special location that had meaning to their loved one. And there are also some that split the ashes among relatives. There are mini-urns available so several people can have part of the remains. Some may choose to keep them while others might scatter them. There are even picture frame urns and jewellery urns to consider. Cremation brings a new level of versatility in the final resting place. For families that aren’t completely sold on the idea of one plot of land for their loved one, cremation gives choices that they couldn’t have had otherwise. Keep in mind that there are no hard and fast, right or wrong answers regarding cremation and traditional funerals. When someone in your family passes away, you will want to consider what they would have wanted, what your family needs, and the pros and cons of each method to make a final decision. If you choose a cremation because of budget concerns, there is nothing wrong with that. It is a completely respectful choice to make that your loved one would understand. If you want a cremation because of versatility and the freedom in options, that’s a good reason as well. If your family has always gone with traditional burials in the past, there is nothing wrong with making a switch to cremation the next time someone passes on. Cremation allows you to have more money available for a memorial service or celebration of life, if that’s what you choose to do for your family member. You can also save money to pass more funds along to the next of kin or to use for anything else. You can also honour your loved one in any way you see fit through a memorial service open to the public, a private intimate affair, or a mix of the two. If are considering a cremation when planning the final service in advance, or after a loved one passes away, contact Fixed Price Cremations. We can give you the information you need on cremation packages that might be right for your family. With low prices on the cremation itself, you can decide what type of memorial service you want to have for your loved one in whatever location around Australia you choose. Every individual is unique and deserves a service that honours their personality and style. If you are not sure what your loved one would have wanted, look through the options and talk to cremation professionals to see if it’s the right fit for you. It never hurts to look through the choices so you can make an informed decision. Contact us at 1300 262 797 and we’ll discuss your needs. Let us get to know your family so we can make professional recommendations based on your preferences. Your loved one was important to you and we will treat them with nothing but the utmost care, respect, and dignity. In the end, we want to help you honour your loved one in the way you see fit, whatever that might be. If you need a cremation package in Melbourne, we can help.